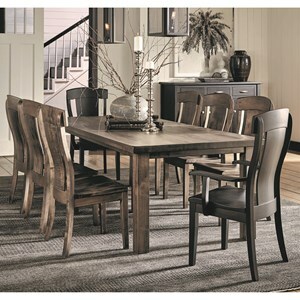 Furnish your dining room with this streamlined and expertly crafted nine piece table and chair set. Each piece is constructed from robust solid wood using time-honored techniques to ensure heirloom quality. 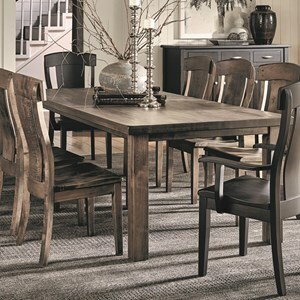 The table features a sleek and simple frame, while the surrounding side and arm chairs boast unique wavy paneled seat backs and slightly rounded tops for comfort and style. Furthermore, each piece is available in numerous wood types and finishes so you can create the look that suits you best. The Eastchester 9 Piece Solid Wood Table and Chair Set by Daniel's Amish at VanDrie Home Furnishings in the Cadillac, Traverse City, Big Rapids, Houghton Lake and Northern Michigan area. Product availability may vary. Contact us for the most current availability on this product. Browse other items in the Eastchester collection from VanDrie Home Furnishings in the Cadillac, Traverse City, Big Rapids, Houghton Lake and Northern Michigan area.